The power of the object to bring us the past is phenomenal; as a museum, that's our stock in trade - a whole house of evocative objects that tug at one's sleeve with stories to tell. But this power has fascinated people even before the organized focus of museums. Keepsakes, souvenirs, tchotchkes, totems, memorabilia: all forms of objects that come with auras attached. 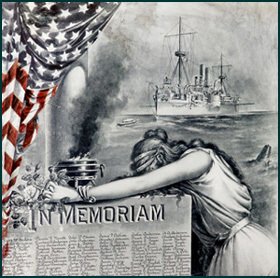 Through such things, we remember what has passed, what we have lost, or what we need to never forget. 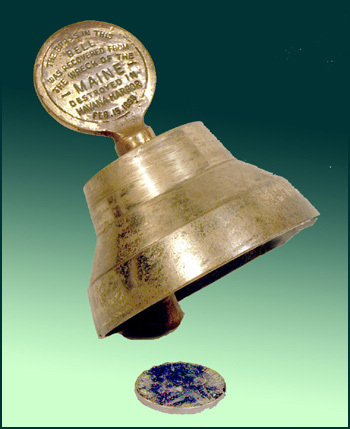 Early museums were often simply loosely organized collections of such personal fragments; Maine Maritime Museum has many such strange and wonderful tokens, among which are a particularly quirky form of maritime souvenir, that of an otherwise everyday object made from a piece of a wrecked ship. 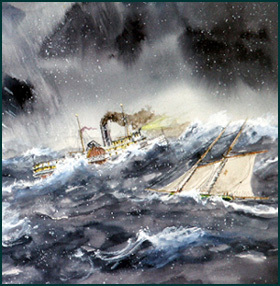 The utter loss of the steamer Portland in the now infamous November gale of 1898, has haunted New England maritime lore since the days following, when pieces of the broken vessel began to wash ashore. Called New England's Titanic, the Portland's fate was similarly entwined in defiance of the weather and the puzzling hubris of her commander. The recent identification of the submerged wreck off Cape Cod has only enhanced the story. Several artifacts salvaged from that storm have made their way into our collection over the years: an oar, a life ring, a sign - the expected flotsam. 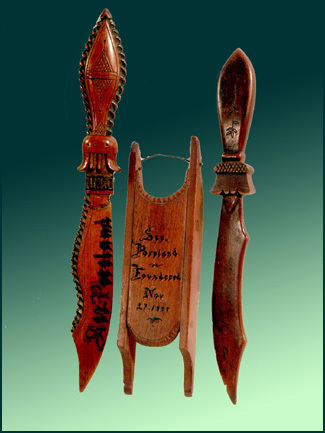 But it is these seemingly benign items (above), two letter openers and a toy sled, all made from wood salvaged from the foundered Portland, that I find peculiarly arresting. The transformation to years of quiet desktop life from the screaming tumult of that last night afloat is eerie. 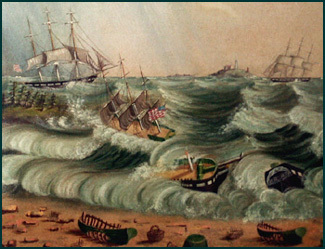 Another three-day November gale spelled calamity for the Bath-built ship Hanover in 1849 at the mouth of the Kennebec, the river where she had been launched into the Houghton fleet eleven years previously. Homeward bound with a hold of Spanish salt, Captain Rogers' piloting of the storm-bound river entrance contradicted his own good reputation, local knowledge, and common sense. This detail from a four-view portrayal shows the end of the Hanover. Somehow, a relatively easy passage toward shelter in the river was missed, and in the vessel's maneuvers to regain advantageous position, it stuck upon a locally known bar, to break completely apart within five minutes. All twenty-four men aboard perished, and the wreck became enshrined in local memory for generations. Three of the many baskets shown here washing ashore are in our collection. 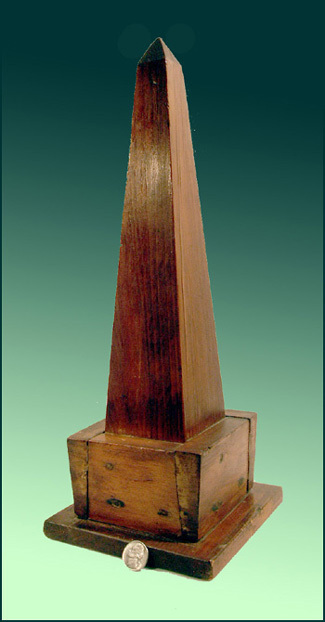 Obelisks have long been symbols of remembrance, which may explain why a piece from a door of the broken Hanover was fashioned into what the record says is a "replica of the Bunker Hill Monument." That landmark granite memorial had only been completed in 1843, just six years before the Hanoverstruck. Oh, how we remember the Maine. The explosion that shattered the battleship U.S.S. Maine in Havana harbor and precipitated the 1898 Spanish-American war, also began an extended souvenir migration. 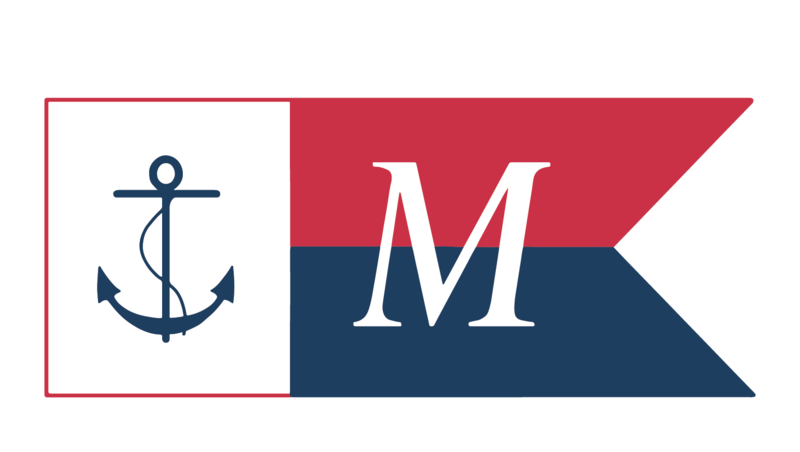 Salvaged pieces of the Maine seem to be in maritime collections and memorials everywhere, cast-off testaments to the patriotic fervor of a young expanding world power. 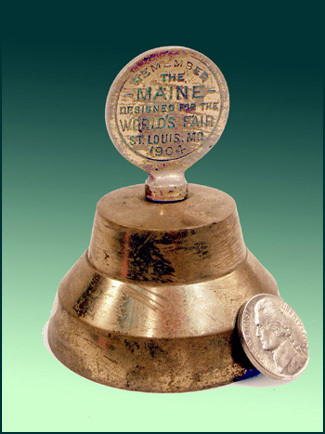 In a twisting of the Biblical proverb that beats swords into ploughshares, much of the Maine was melted into commercial trinkets that commemorated a "splendid little war." The heavy cruiser Vizcaya was the Spanish counterpart to the Maine, actually sent to New York in Jan. of 1898 to reciprocate the visit of the U.S. battleship to Havana. 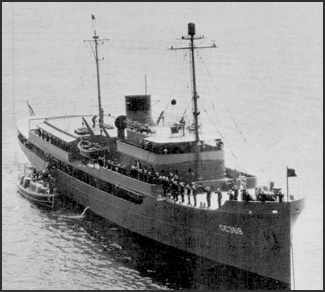 After the Maine's demise in February, the gloves of statesmanship were removed, the Vizcaya was recalled to Cuba, ultimately to be blockaded in Santiago Bay. 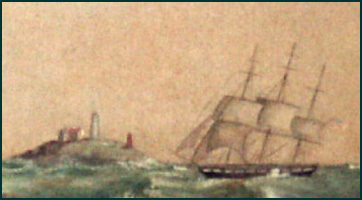 As the Spanish fleet attempted to escape on July 3, 1898, she was severely shelled and run aground by her captain to save the lives of his crew. 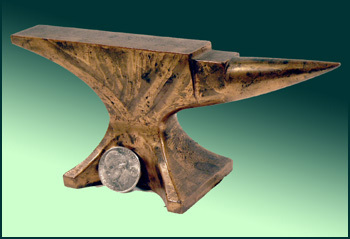 This carefully modeled little bronze anvil may be a memento made by an enterprising foundryman; its partially torn label reads, "Made in Chas. [Charlestown?] Navy Yard of metal from B. Ship Viscaya, sunk in Battle of Santiago Bay, Cuba " The lack of any commemorative wording seems to suggest it was a personally crafted souvenir by someone either in the Navy or with Naval contacts. Without the same iconic power carried by the Maine's fragments, Vizcaya's salvaged remains were probably not widely spread. She was the Enemy, after all. Long the premier icon of our maritime history, USS Constitution endures as the oldest commissioned naval vessel afloat largely through the care and feeding of the U.S. Navy. She has undergone several re-constructions since the original keel was laid in 1794, of which the effort in 1927 created a veritable potlatch of memorabilia. 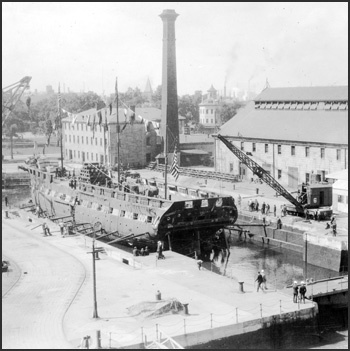 This re-build was supervised by Lieutenant John Lord from Bath, Maine, who besides extensively photographing the project, and importing to Boston, from our then defunct Percy & Small shipyard, its large woodworking machinery (see Notes from the Orlop No. 7), seems also to have released a quantity of Constitution's white oak out into the souvenir stream. Many of the fragments we have are just that, indeterminate chunks in memory of 'Old Ironsides', all proudly and pedantically adorned with the same cast bronze plaque. 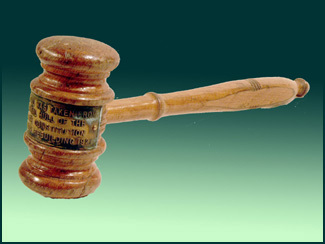 This gavel, also turned from the same anointed, reverenced material off which bounced British cannon fire, must have been endowed with particular order-keeping ability. 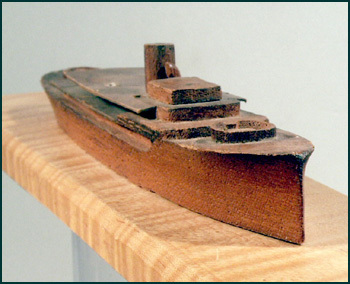 This small (note nickel for scale) but carefully worked and detailed model was carved from the teakfantail rail of USS Williamsburg in 1945 by Lt. Nelson Wood, who served as Chief Engineer aboard from 1943-45, and it reflects one moment in this Bath-built vessel's complicated career from private yacht, to naval vessel, to Presidential yacht, to oceanographic research vessel, to private yacht, to ?... 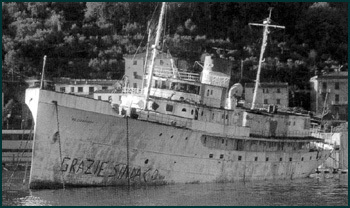 last known to be on the verge of being scrapped in Italy while a preservation group tries to bring her back Stateside. 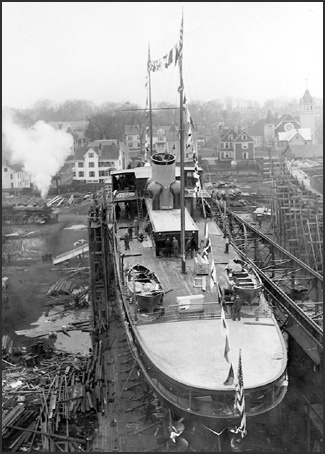 On the ways at Bath Iron Works (above) nearing her launch as Aras in 1930 for a wood pulp magnate, this unusual stern view of the vessel, presumably from a shipyard crane, shows not only the fantail trim that our model may have come from, but also the general smoke, grunge and clutter of the Depression-era shipyard from which astonishing yachts sprang forth. Renamed Williamsburg and absorbed into the war effort in 1941, she fulfilled anti-submarine and flagship duty in Iceland, as well as shipping gold bullion and USO troupes, before returning to Norfolk for an intended conversion to an amphibious force flagship for the invasion of Japan. 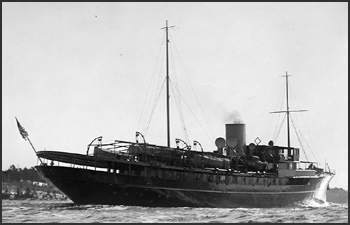 The end of the war cancelled this work and she was re-assigned as Truman's successor to Roosevelt's presidential yacht Potomac. It is at this point, in 1945, that Lt. Wood grabbed a piece of the Presidential-to-be teak and made his model. 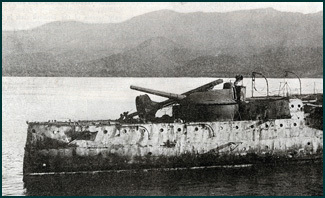 The fore and aft gun-tubs that he has carefully delineated were removed in the presidential conversion. Though Truman used the Williamsburg on several occasions of state, Eisenhower ordered her de-commissioned after one trip aboard in 1953, and she was ultimately turned over to the National Science Foundation for oceanographic work in the '60s. After a dry-dock accident, she slipped away into that twilight of restaurant/museum/hotel/conversions that dowager vessels of her type seem fated to enter. 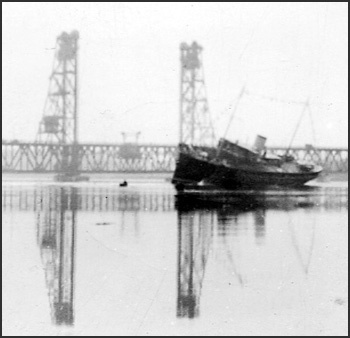 Hitting the Kennebec on launch day, then-Aras rolled violently to port, pitching off three workers into the river, and refused to be righted until extra ballast solved the problem. 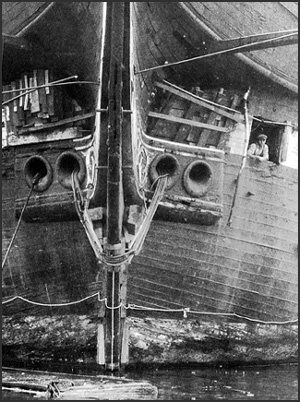 Her attitude in her first minutes afloat is oddly similar (below) to that while she waited for scrapping in La Spezia (above).